We tested the hypothesis that the alpha and beta songs of male bobolinks (Dolichonyx oryzivorus) have separate intrasexual and intersexual functions by presenting caged males and caged females on the territories of male bobolinks. Although all males in our study population share both alpha and beta songs, we found no evidence for a specialized intersexual function of alpha song or a specialized intrasexual function of beta song. Territorial males increased their singing rate of both alpha and beta songs during both the male presentations and the female presentations. The proportions of the two song types did not change between control and experimental periods for either male or female presentations. We found no evidence in support of specialized intrasexual and intersexual functions of note types. 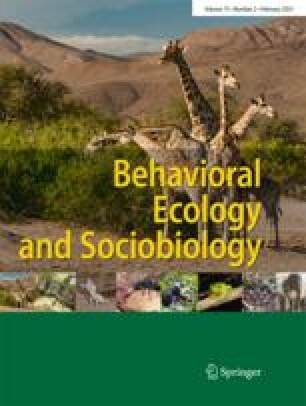 Only 10% of the vocalizations initiated by territorial males were complete alpha or beta songs, while 87% were song fragments, and the remaining 3 % were compound songs. We did find that territorial males responded to simulated male intruders by increasing the proportion of fragmented songs and decreasing the proportion of compound songs. Moreover, males included fewer notes per song initiated and sang a higher proportion of songs that included only introductory notes during male presentations. We conclude that the vocal response of territorial male bobolinks to conspecific male intruders is to sing short, simple sequences of either song type. We found no consistent changes in vocal behavior of territorial males in response to female presentations other than increases in song rates.